Transferred from the Dental School Library to the University Archives in 1985, 1989 and 1990. The collection has been organized into the following series: 1. Administrative and History Files, 1878-1987; 2. Alumni Records, 1888-1969; 3. Biographical Files, 1885-1988; 4. Thomas W. Evans Museum and Dental Institute Records, 1861-1985; 5. Financial Records, 1968-1985; 6. Other Organizations, 1876-1968; 7. Personal Papers, 1849-1986; 8. Photographs, Prints, and Graphics, 1798-1985; 9. Scrapbooks, 1866-1986; 10. Slides, Tapes, and Memorabilia, 1885-1981. Each series has been arranged alphabetically. In 1877, the medical faculty of the University of Pennsylvania proposed that a department of dental medicine be established. The Medical Committee of the Board of Trustees of the University authorized a committee of the medical faculty to approach the two existing dental schools in Philadelphia–the Pennsylvania College of Dental Surgery established in 1856 and the Philadelphia Dental College founded in 1863–to inquire whether one or the other would agree to become associated with the University. The faculties of both schools officially declined the proposal, but Dean Charles J. Essig, and Drs. Edwin T. Darby, George T. Barker and James Tyson of the Pennsylvania College of Dental Surgery indicated their approval and interest. These men were invited to join the faculty of the University and thereby formed the nucleus of the new dental department of the University. The School of Dentistry opened in April 1878 with Dr. Essig as Secretary of the faculty (a position equivalent to the deanship). After Harvard and Michigan, Penn became the third university in the country to establish a school of dental medicine. The first class had a total of fifty-two students, half of whom transferred from the Pennsylvania College of Dental Surgery. The University required students to complete a two-year curriculum including operative and mechanical dentistry, dental histology, dental pathology, metallurgy, chemistry, anatomy, physiology, material medica and therapeutics; a thesis; and a presentation of treatments of patients in operative and prosthetic dentistry. In 1879 twenty-five of the original fifty-two students were awarded the degree of Doctor of Dental Surgery. When Dr. Truman became dean of the school in 1883, he began to introduce preclinical technic work into the courses in prosthetic dentistry. The introduction of these courses, as well as the requirements of the National Association of Dental Faculties, resulted in an extension of the dental program to three years in 1891. With this emerged the need for better facilities. The school proposed the construction of a new school before Truman’s retirement in 1895. The school was first located in the basement of Medical Hall (now Logan Hall). In 1878, it moved to the first floor of the new Hare Laboratories and remained there for over eighteen years. The Dental Hall served as the site of the school from 1897 to 1914. Under the deanship of Edward C. Kirk, who served from 1895 to 1917, the Dental School enhanced its international reputation. The school proposed to increase the study of dentistry from three years to four years in 1903. Lacking support from other schools, however, the idea did not come to fruition until 1917. Under Kirk’s administration, the school established its graduate program in 1910 to keep abreast of the latest developments in dental medicine and technics. In 1909, the Pennsylvania College of Dental Surgery, short of funds to modernize its equipment and enlarge its teaching staff, merged with the Dental School of the University. In 1916, the school further expanded by merging with the Dental Department of the Medico-Chirurgical College of Philadelphia. As a result of these mergers as well as the admission of women, which began in 1914, the student body increased, calling for yet another new building. Dr. Charles R. Turner succeeded Kirk as dean in 1917, the same year that the four-year course in dentistry became effective. In 1921, the requirements for admission were raised to one year of college; this was further extended to two years of college in 1927. In response to student demand for a Bachelor’s degree program, the University and the Dental School announced in 1919 a seven-year course leading to both the A.B. and D.D.S. degrees. The school introduced a course in internal medicine for dental students in 1934. This program encouraged the students to consider the patient as a whole, something often neglected in the development of technics in dentistry. The course under the direction of internists at the University Hospital was among the first of its kind offered in the United States. Lester W. Burket, dean from 1951 to 1972, further promoted oral medicine as a concept in dentistry. In 1964, the school changed its name from the School of Dentistry to the School of Dental Medicine. The school reoriented and expanded its educational and research programs and rehabilitated its facilities. Clinics were re-equipped or modified to permit better teaching and the use of new technics and clinical procedures. The curriculum also became more dynamic and flexible. The school established a Learning Laboratory which made extensive use of color video TV cassettes and slide-tape facilities and permitted individual patterns for student learning. With a much increased demand on dental research, two new buildings were erected in this period–the Dental Research Building in 1958 and the Levy Oral Health Sciences Building in 1969. The collection documents the development of dental education in the University of Pennsylvania from the time the University created its dental department to the present. Because the Dental School is one of the oldest in the United States, the early records contain information of historical significance to studies of the evolution of dentistry in the country, and in particular in the Philadelphia area. The Administrative and History Files contain historical material from the late nineteenth century to the mid-twentieth century including early records of the academic programs and alumni activities as well as the agreement between the Thomas W. Evans Museum and Institute Society and the Trustees of the University of Pennsylvania in 1912. This series also features the school’s centennial celebration in 1978, student and faculty lists from 1878 to 1978, the Oral Hygiene program, class reunion activities, and dental building dedications. The correspondence file of the dental school library records the relationship between Penn and other dental institutions as well as acknowledgment of gifts from the school’s faculty and alumni. A predominant portion of the Alumni Records concerns the Dental Alumni Society of the Department of Dentistry of the University of Pennsylvania. The file includes the Society’s constitution and by-laws, its annual meeting minutes and programs, and the minutes of its Executive Committee from 1933 to 1960. The Biographical Files contain data of approximately 200 individuals including faculty members, alumni, and well-known dentists who had no direct relations to the school. Also included in this series are a set of index cards for hundreds of persons engaged in the profession. Of special interest is the series of the Thomas W. Evans Museum and Dental Institute Records consisting of manuscripts, photographs, slides and several memorabilia items. Included are records documenting the invaluable Evans collection, among them Evans’ will, Charter and By-laws of the Museum, an inventory prepared shortly after his death and the inventory prepared by the Christie, Manson and Woods International Inc. when the company was commissioned to sponsor a sale on the collection in 1983. There are Evans’ personal photographs and reproductions of art works that portray his experience in Paris, especially in helping the Empress escape to England during the fall of the Second French Empire. In addition, this series includes a file of Gerald Carson papers, which consists of the material Carson referred to in preparing his biography of Evans, index cards for the writing project, and manuscripts of the book Dentist and the Empress: an American in Gas-lit Paris in both carbon and typescript copies. The Other Organizations series contains records of fourteen institutions outside the University. Three organizations which enjoyed close relationship with Penn are the Pennsylvania College of Dental Surgery, the Pennsylvania Dental Association, and the Academy of Stomatology. The largest series of the collection is the Personal Papers of eleven dentists, mostly of faculty members or successful alumni. The series includes papers from Joseph L. T. Appleton, George Ronald Bevan, Edwin T. Darby, Arthur Bertraim Gabel, Milo Hellman, Roberts H. Ivy, Edward C. Kirk, and Hermann Prinz. Their papers contain lecture notes, manuscripts, correspondence, clippings, and medical, dental and scientific writings. Of note are the papers of Newill Sill Jenkins (1840-1919), an American dentist with no affiliation to Penn. Jenkins spent most of his career practicing in Germany and by the turn of the century, became one of Europe’s finest dentists. His papers include awards and honors, notebooks, patient records from 1872 to 1892, photographs, and records and memorabilia related to the celebration of his 75th birthday, an international event for the dental profession in Europe. The Photographs, Prints, and Graphics series contains a wealth of graphic images spanning a period from 1798 to 1985. There are photographs of alumni gatherings, class pictures (group pictures and individual portraits), class reunions, dental buildings and facilities, faculty pictures, fraternities and societies, oral hygiene program and classes, Pennsylvania College of Dental Surgery and other organizations, and various gatherings of the dental profession. Other graphics include awards and certificates issued from 1798 to the post-World War II period as well as many art reproductions and cartoons on themes of dentistry or dental history. Four scrapbooks, compiled by S.C.G. Watkins from 1866 to 1932, consist of such items as clippings, obituary notices, memorials of deceased dentists, poetry tidbits, and editorials of dental interest. John M. Whittock, the Dental School librarian, collected clippings, 1897-1900, on the history of the dental department of the University of Pennsylvania in one volume and kept three additional volumes of news clippings on recent decades. The Slides, Tapes, and Memorabilia series includes over two dozen tape-recorded interviews with faculty members in 1975-1976. Among the memorabilia are book plates, attendance cards of dental students in the last century, and print blocks. Related materials: The dental school records have been filed under UPC 4. Bibliographical information by author, n.d. Alumni annual reunion programs, n.d. Promotional brochure “Dentistry as a Way of Life”, n.d.
Syllabus for sophomore class on root canal technic, n.d.
University’s Men in the Great War, supplement to Alumni Register, 1920 Oct.
Allen, Frederick W, group photo, n.d. Angle, Edward Hartley, two photos and a sketch, n.d.
Berdmore, Thomas (died 1785), n.d.
Blaschke, Hugo J. (graduated 1911), photo portrait, n.d.
Brubacker, Albert P., photos, n.d.
Crane (of Paris), two photo portraits, n.d.
Dechant, Esther (assistant to Dean), n.d.
Dorrance, George M. (1877-1949), n.d.
Eglin, Archibald Campbell , n.d.
Garretson, James E. (1828-1895), n.d.
Hellman, Milo, Class of 1905, portrait photo, n.d.
Jordan, J. Stanley, Class of 1932, n.d.
Moore, William H. (1867-1946), n.d.
Osborn, Beatrice, Class of 1878, n.d.
Swiderska, Countess Helene Vongl de, n.d.
Tracy, William Dwight (1873-1937), n.d.
Bella Rosa–Thomas Evans’ mansion in Paris, photo prints and a negative, n.d.
Carriage and other exhibits, photos , n.d.
Christie, Manson and Woods International Inc.
Photo print of a portrait painting, with negative, n.d. Portrait photos, with negatives, n.d.
Illustrations in photo prints, n.d.
Letter from Enielie S. Froth to the Evans Museum re a shawl used by Empress Eugene, n.d. Pass issued to Evans for entry to Palais les Tuilenes, n.d.
Rotogravure photos from “Collection Ferrand”, n.d.
Tuileries, photo negative of a book plate from The Tuileries by Louis Leon Theodore, published in London (H. Jenkins) in 1934, n.d.
Will of Dr. Thomas W. Evans, Charter and By-laws of the Museum, n.d.
Manuscript, carbon copy, (up to p. 222), n.d.
Manuscript, carbon copy, (pp. 223-378), n.d.
Manuscript, typescript copy, (pp. 188-end), n.d.
Manuscript, typescript copy, (up to p. 187), n.d.
Hahn, Janine, “Recherches sur le Docteur Thomas W. Evans: sa Jeunesse aux états Unis”, n.d. Photos in Evans’ book The Fall of the Second French Empire, list, with a negative of Prince Imperial, in artillery uniform, n.d.
Valois Farms Castle: a Breath of Paris in the Finger Lakes, n.d.
Veillet, Bernard, “Recherches sur le Docteur Thomas W. Evans: son Hotel Particulier”, n.d. Mechanical Dentistry by Charles R. Turner, n.d.
Real estate and business management, n.d.
“Diseases and Care of the Teeth”, n.d. Course in surgery, third year, synopsis, n.d.
Essentials of Oral Surgery, manuscript, n.d.
Paper, “A Renewed Plea for Esthetic Dentistry”, n.d.
Photo album, “Pension Fritzsche”, n.d.
Group picture taken in front of Jenkins’ villa, n.d.
Jenkins with someone in a garden, n.d.
Queen of Bulgaria (Elivnora), n.d.
Silverware by a Parisian, n.d. Statue of Horace Wells, discoverer of Anaesthesia, photo given 1916 Dec. Letters of thanks, 1911 Jan.
Johnson, C. N., “Orthodontia” (article on a cardboard plate), n.d.
Book, A History of Dentistry, n.d. Microscopic views of tissues, n.d. Examination of the Patient, manuscript, n.d.
History of the School of Dentistry: an Account of its Beginning and Growth, passages of Milton B. Asbell’s A Century of Dentisry, n.d.
Key to Sheldon Friels Map of the Occlusion of the Teeth, n.d.
Lectures for juniors and seniors, n.d.
Legal cases and search rewards, n.d.
Manuscripts, articles, and notes by H. Prinz, n.d.
Notes on Thomas Evans, n.d. Paintings and figures representing the development of dentistry, n.d. Teaching of Materia Medica and Therapeutics at Penn Dental School, lecture notes, n.d. The Environment, from Etiology of Dental Caries, by Brugnatelly, n.d. The Late Thomas W. Evans, manuscript, n.d.
Therapeutics: Oral Hygiene, lecture notes (? ), n.d.
Treatise (in German) on cleft palate by Ernst Ostermann, n.d.
Wandering Rash of the Tongue, notes on index cards, n.d.
Apollonia mit Avone, Zwänge und Zahn (clipping from Zahnärztliche Mitteilungen/Sondernummer), n.d.
C. N. Peirce Dental Society, group picture, n.d. Casting lab, 2 photographs and 10 negatives, n.d.
Children’s Clinic, 1 photograph, n.d.
(4″ x 6.5″), thirty, n.d. Unidentified, with Dean Edward C. Kirk in the middle of the front row), two, n.d. Unidentified, with Dean Edward C. Kirk in the middle of the front row, two identical prints, n.d. Classes of 1901, 1907, 1914, 1916, 1922, 1926, 1931, and n.d.
Cup presented to James Truman, negatives, n.d. The Dean, the Darlings and the Deceased [J. L. T. Appleton] n.d.
Lecture Room, photograph, with two negatives, n.d. Dental hygiene, first class, with negative, n.d. 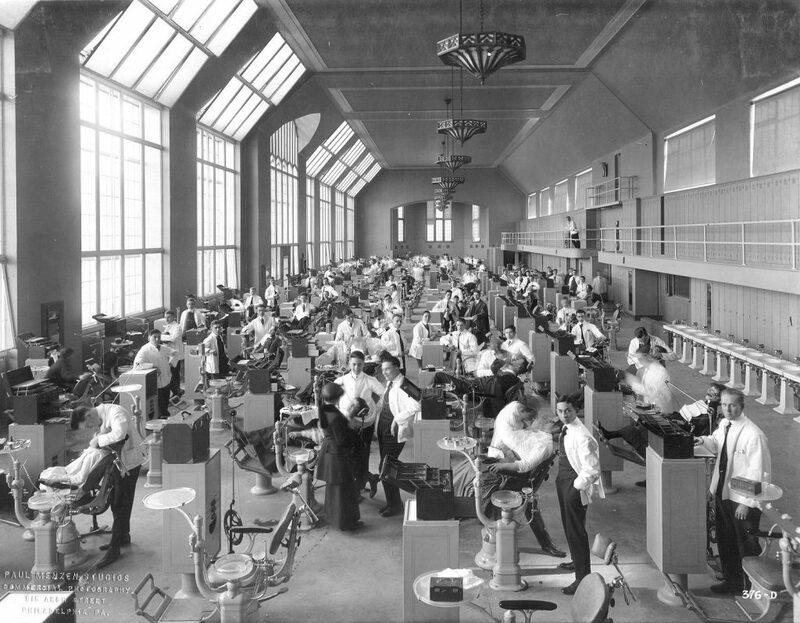 Dental lab in the Hare Building, photograph, n.d. Dental models, 10 prints, n.d. Dental School clinic, two photos, n.d. Dental School, 10 prints, n.d. Dental Students. Group Photograph. Unidentfied n.d. Dental surgery demonstration class, unidentified, n.d. Entrance of the Evans Museum, n.d.
New clinic, one photograph of Dr. Burket showing the sketch of the new clinic, with negatives of the inside view of the clinic, 1966 Sept. Freshman Laboratory, two photo negatives, n.d.
World War I officers from the Dental School, n.d.
Hare Laboratory, operating room and basement, n.d.
Landscape photo, “Château du Grand-Mesnil–Entrée: Façade Est.” n.d.
Development study and plan, artchitect’s, n.d.
Medical Hall–Mechanical Laboratory (home of Dental School, 1878-1896), inside and outside views, n.d.
Operation Lecture Room, four negatives, n.d.
Dr. Richard Wall and five others at a mannequin, n.d.
Pierre Fauchard, from a portrait painted in 1726, n.d.
Miller, Frederick D. , n.d.
Parry, Ely, Professor of Chemistry, Pennsylvania College of Dental Surgery, n.d. Von Rohenheim, Bombustus Paracelsus , n.d.
Wells, Horace, two identical prints, n.d.
S.S. White Dental Manufacturing Company, the Frankford Philadelphia Factory, one photo, n.d.
Temple University School of Dentistry, n.d.
Tracy Clinic, seven photographs and 14 negatives, n.d.
Truman Clinic, two photos, n.d.
U.P. Dental Junior Class n.d.
Work at a laboratory, unidentified, n.d. Biological Department and Veterinary Department, n.d.
College Hall, photo prints and a negative, n.d.
Group picture of sportsmen with a trophy cup in the center, n.d.
Library (the present Library of Fine Arts), n.d.
University buildings and scenes, n.d.
University facilities, interior views, three photographs, n.d.
U.S. Navy, certificate of achievement to the Dental School for the services in WWII, n.d. Certificate of donation of an oil painting of Dr. Leroy Massey Ennis from William H. DuBarry, n.d.
“The Dentist, or Teeth Drawn with a Touch”, n.d.
Vor der Zahnoperation, gift of Herman Prinz (1943), n.d. Dental, a panoramic view, n.d. Dental deity images in two art works, n.d. Dental School building, printed water color by Charles Pizer, n.d.
Dentists’ Supply Company of New York Promotional sign n.d.
Grant, W. H. R. n.d. Identified Group Photographs, Asheville, N.C. n.d. Miner, Leroy M. S. n.d.
Reed, Ernest W. [tintype] n.d.
Van Hasselt, A. L. J. C n.d. Dental Department Operating Room in Hare Laboratory n.d. Dental Hall Lecture Room n.d.
Evans Institute Interior Hallway n.d. Extracting Room Dental Hall n.d. Mansion in Paris “Bella Rosa” n.d.
Old Evan’s Homestead 40th and Spruce n.d.
Sullivan, Charlotte Klatt Director of Oral Hygiene Department n.d.
Will of Dr. Thomas W. Evans n.d. Dental Department Germantown Hospital (2) n.d. Dental Exam Room “Compliments of Dr. Fred L. Wood” n.d. Dental Exam Room [mobile?] n.d. Dental School in Helsingfors n.d.
Land, C. H and his Laboratory Detroit n.d.
University of Maryland Infirmary, Dental Department n.d.
University of Minnesota Main Infirmary, Dental Department n.d.
Teeth and dental diseases, 46, n.d.
Brougham, Guy, Class of 1912, tape in a 5″ x 5″ cardboard box, n.d.
Microfilm, David D. Zweben to Seymour A. Alcabes, Class of 1942, n.d.
Sharp, Jacob (for books from his library), n.d.
Caricatures of faculty by Dr. Miguel S.Tejada, n.d.
Commencement cap and gown, gift from Dr. Ernst, via Dr. Hamid, gift to the Dental School in 1987 Jan. Flag from Tokyo Dental College, n.d.
Metal plate inscribed with “James Smith, Academy 1752, Colonel of Pennsylvania Militia, Signer of the Declaration of Independence” n.d.
Photographs, three, of an old dental clinic, inside views, glued to wood plaques, gifts of Dr. Paul L. Segal, 1981 Feb. Portrait of Dr. Hornwell with someone, n.d. Portrait of Dr. Lewis, Oborn G. L., n.d. Portraits of Drs. Morris and Appleton , n.d.
S.S. White Award Medals – American Institute New York n.d.